Does SaltConf18 have a code of conduct for attendees? Yes. All SaltConf18 attendees must agree to adhere to the SaltConf18 Code of Conduct. My boss is a bit slow on the uptake. Can you help me make a case for attending SaltConf18? Your boss isn’t slow, there’s just a lot going on. But yes…we figured you’d ask for help so we created this form letter you can use to convince your boss to send you to SaltConf18. See you in Salt Lake City in September. SaltConf18 Pre-Conference Training is held on Monday and Tuesday, Sept. 10–11, 2018. 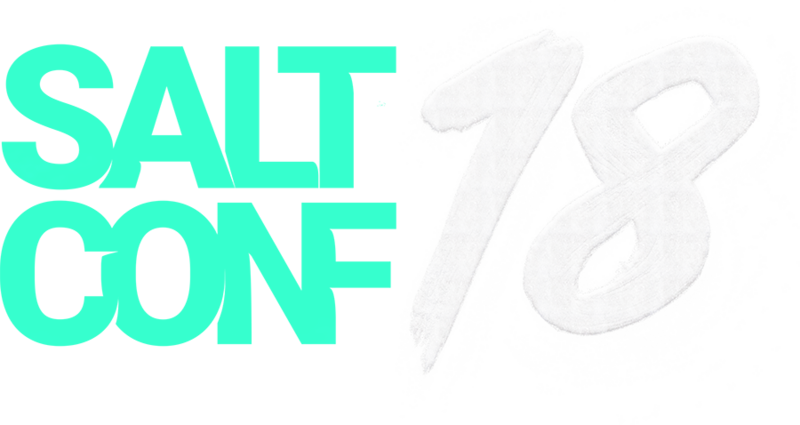 The SaltConf18 main conference runs from Wednesday through Thursday, Sept. 12–13, 2018. What SaltConf18 discounts are available? Early-bird and group discounts are available for SaltConf18. The early-bird discount will expire on Friday, August 3. Details are provided on the SaltConf18 registration page. Contact SaltStack with questions about pricing and registration. All SaltConf18 courses, sessions, and activities will be held at the Salt Palace Convention Center in downtown Salt Lake City, Utah. SaltConf18 attendees stay at the convenient Salt Lake Marriott Downtown at City Creek which is directly across the street from the main entrance to the Salt Palace. SaltConf18 attendees have exclusive access to discounted room rates at the Marriott of $229 per night plus tax. When is the last day that I can register? Registrations will be accepted until the first day of the conference but we fully expect the conference to sell out before then. Also, please register as soon as possible to take advantage of SaltConf18 discounts. Can I attend the pre-conference training and not the rest of SaltConf18? No. SaltConf18 Pre-Conference Training is reserved for SaltConf18 main conference attendees only. Many pre-conference training courses will reach capacity. How much does SaltStack training usually cost? SaltConf18 Pre-Conference Training offers a more targeted and flexible training experience at a substantially reduced rate ($600 or $400) compared to any other SaltStack training offering. Attendees also receive one complimentary sitting for the SaltStack Certified Engineer exam. By comparison, SaltStack virtual, instructor-led training costs $2,195, and one sitting for the SaltStack Certified Engineer Training exam regularly costs an additional $350. When can I take the SaltStack Certified Engineer exam? One sitting for the SaltStack Certified Engineer Training exam is offered to SaltConf18 Pre-Conference Training attendees. Attendees can take the timed exam from 5:45–6:45 pm on Monday or Tuesday after pre-conference training concludes for the day, or 12:30–1:45 pm on Wednesday or Thursday. Visit the SaltConf18 registration and information desk on-site for more details or to register to take the exam. Who should I contact if I have difficulty registering online or need assistance? Please contact the SaltConf18 registration team at 720-722-7398 or saltconf@saltstack.com. How do I know if I submitted my registration correctly? Once your registration is submitted, you will receive an on-screen confirmation as well as an email confirmation including your confirmation number. If you need assistance with registration, please contact the SaltConf18 registration team at 720-722-7398 or saltconf@saltstack.com. If you need to make changes to your registration, log back into the SaltConf18 registration portal by using the email address you originally used to register and your SaltConf18 registration confirmation number. If you still need help, please contact the SaltConf18 registration team at 720-722-7398 or saltconf@saltstack.com. What is the cancellation policy if I can no longer attend? All cancellations received on or before June 1, 2018, will incur a $100 cancellation fee. All cancellations received between June 1–August 3, 2018 will incur a fee equal to 50% of the registration fee. All cancellations received between August 4–September 10 will incur a fee equal to 100% of the registration fee. Cancellations must be received in writing at saltconf@saltstack.com. Attendee substitutions are allowed up until 2 weeks before the conference. What is the meeting attire? The attire is business casual, but t-shirts will also be just fine…especially your favorite SaltStack t-shirts from years past. The weather should be lovely in Salt Lake City this time of year. Is there a SaltConf18 group discount? Yes. Register three people, and get one SaltConf18 main conference pass free! Register your group at the same time to utilize this discount. At the end of the registration process for the first attendee, click the “Add Person” button. If you have already completed an individual registration and would still like to invite others to attend, please contact the SaltConf18 registration team at 720-722-7398 or saltconf@saltstack.com. Is a student discount available for SaltConf18 registration? Yes, but you will need to verify your status as a student with the SaltConf18 registration team. Please contact us at 720-722-7398 or saltconf@saltstack.com and we will be in touch with discount details and next steps. What will the temperature be in Salt Lake City during SaltConf18? The September average high temperature is 80 degrees and the low is 52 degrees Fahrenheit. There are usually only two to three days of rain in September.